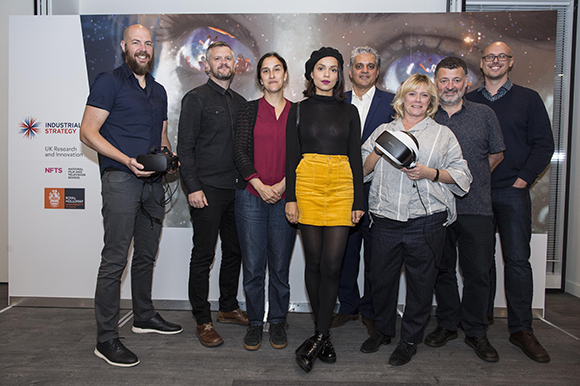 The National Film and Television School, in partnership with Royal Holloway, University of London and a host of industry backers, has launched a new centre of excellence for immersive storytelling. The National Centre for Immersive Storytelling: StoryFutures Academy will bring together established storytellers from across the worlds of film, television and games to explore the potential of immersive technologies. The centre is supported by world-leading creative companies and organisations, including: Imaginarium Studios, BFI, Sky, Punchdrunk, UK Games Fund, REWIND VR, McCann Erickson, Sony Interactive Entertainment, HTC Vive, Digital Catapult and Screen Skills. It will develop cutting-edge creative training and research programmes in immersive storytelling to ensure the UK creative workforce is the most skilled in the world in the use of immersive technologies. As well as experimental labs, workshops, placements and courses, the centre will support and co-fund dozens of real immersive productions with a focus on storytelling. Organisations from the screen industries will be invited to be part of experimental labs run by NFTS and Royal Holloway starting with a number of high profile supporters of the centre, including: Oscar winning writer, director and producer, Asif Kapadia (Senna, Amy), award-winning actor and comedian, Royal Holloway alumnus Sir Lenny Henry (Broadchurch), BAFTA winning actress Georgina Campbell (Black Mirror), BAFTA winning director and NFTS alumna Sarah Gavron (Suffragette) and Oscar nominated writer, producer and director, and NFTS Associate Director Alex Garland (Ex Machina). The National Centre for Immersive Storytelling: StoryFutures Academy is led by co-Directors Jon Wardle of the NFTS and James Bennett of Royal Holloway, University of London. The centre is committed to ensuring diversity of participation, giving voice and form to the full range of British talent. We are supported by Sir Lenny Henry on our steering board and have pledged to meet his campaign’s goal of ensuring screen industries reflect British society: 50% female and 15- 20% BAME participants. Our approach will help ensure that the ideas generators of the future are as diverse as its audiences will be. As we roll out our programme of opportunities, we will include bursaries to ensure that no one is excluded due to their income. We will also be working with partners to develop training and short courses all over the country. To find out more about the opportunities available, visit the StoryFutures site. Watch the Evolution of Storytelling Promo below. Be part of the story.